Discussion in 'Downhill & Freeride' started by downhill mike, Nov 26, 2012. News Release: Registration is Open for the First Gravity Qualifier of the Year for the USA Cycling Nationals! 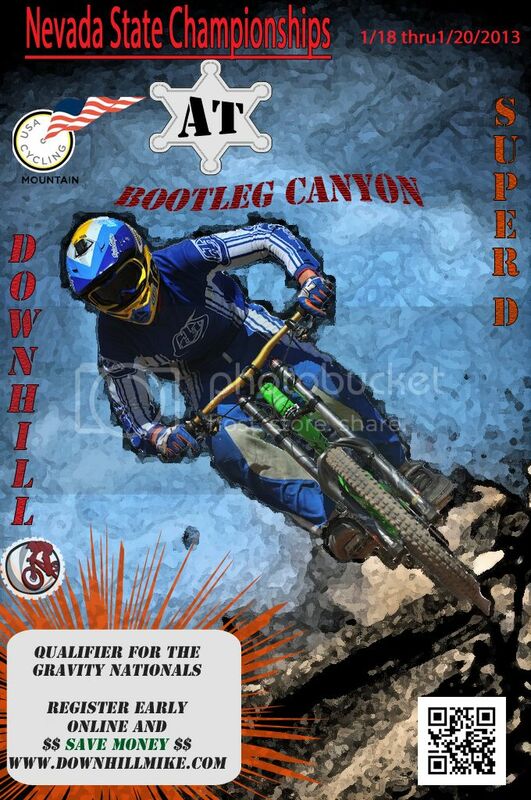 On January 18 thru 20, 2013 some of the fastest Downhill and Super D Mountain Bike Racers will be going for the Gold! 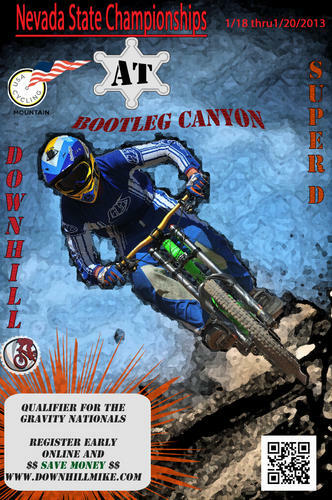 Bootleg Canyon in Boulder City, Nevada will once again play host to USA Cyclings Nevada State Downhill Championships. Boulder City is conveniently located only 23 miles from the Las Vegas Strip and is one of the coolest mountain biking towns anywhere! Event promoters have worked hard this year making sure that this Holiday Weekend (MLK) works best for all racers. In the past the Nevada State Champs shared the same date as the Southridge Series. Not this year! Organizers feel this will create the best possible competition for Gravity Racing ever! Being the 1st Downhill Qualifier for the Nationals in 2013, USA Cycling State Championship Medals will be awarded to the top 3 finishers in each category and age bracket. Besides medals and qualifying for the Nationals, pros will be competing for cash, while amateurs will compete for prizes from event sponsors. Online Registration is open now! Save $25.00 to $30.00 by registering online! 12-6-12 Update: The 1st 100 registrants will receive an event t-shirt courtesy of Go-Ride.com and the Whiteface Mountain Bike Park. We also have 2 bikes to be raffled off. Bikes are from Black Rock Bicycles in Reno (Venice 3 G) and KHS Factory Racing (Lucky 7 frame only). All that register online or on-site will receive 1 raffle ticket for each race they enter (dh, chainless dh & sd), giving you up to 3 chances to win a sweet prize. The Hacienda Hotel/Casino has reserved a block of 20 rooms for only $29.95 each. Available only from January 17 thru January 20, 2013. Event enhancements continue to stack up and we still have 5 weeks to sweeten the pot even more. Online registration closes tomorrow (Sunday January 13) at midnight. On-site registration will open at 9:00 am on Friday January 18th at 9:00 am sharp, but will be $15.00 more for each race. Register this weekend online and save!